Which is better for webcomics, long chapters or short chapters? I realize not all webcomics use the chapter system, but for those that do (like SuperFogeys), which is best? I think about this often. The average SuperFogeys chapter is about 30 strips, but some have been much shorter, and at least one is twice that length. Does it matter? I think one of the advantages of shorter chapters is that I can hone in on a moment or a character. The shortest SF chapter, Chapter 8, “The Captain and the Spy,” was an intense little character study of Cap and Spy Gal. I liked it at the time and felt it was necessary, but it doesn’t get talked about much when people look back on SF history. Same with Chapter 11, “The Doctor and the Doctor.” Most refer to the last strip in 11, if they refer to it at all. I wonder if these shorter chapters are seen as too slight. Contrast that with chapters like Chapter 7, “Visiting Day” and Chapter 10, “Bubbles of Light.” A lot happened in those chapters and people seem to really dig them. Does the length help them? Or is it just the high degree of incident? 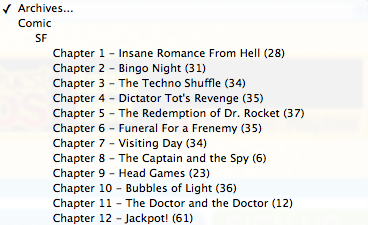 And what of Chapter 12, “Jackpot!”? 62 episodes total. Some have said that this chapter has dragged because, according to them, not much happened in the first half. Others have told me it’s their favorite so far because of all that’s gone on from the very first episode. Which is it? I’d love to know your thoughts. Which, as a reader, do you tend to prefer? Long chapters or short ones? I don’t actually care if a chapter is long or short, just as long as the story is awesome. I think it’s important to mix them up a bit. Thinking of other webcomics which use chapters, the ones which are most successful in storytelling intersperse the two. After a long chapter in which there is much drama, character development, plot twists, etc., it’s nice to take a break with a short chapter. The short ones do not necessarily have to contribute much to the overarching plan of the entire comic; they can just be a bit of comic relief, development of a minor character, introduction of a new character, etc. Then as the short one draws to a close, there is a reminder to the reader that there is a Big Story moving along and it’s time to get back to it. I can see the advantage of that approach, but my frustration with comics of that type is that I feel like the author is just wasting time when the in between chapters don’t progress the story enough. The story takes long enough to tell on its own. I’d hate to delay it further. Interesting, because I’ve been assuming all along that the next chapter of SF would provide a bit of a break. But given your point of view, I guess not. It seems like this would be much more of a concern with less cohesive strips. For quite a awhile, it’s been understood by readers (both from the strip’s development and your comments) that SuperFogeys is driven by a single, cohesive story (even though it incorporates elements of back- and side-story). So, I would tend to think that as long as the chapters were well-defined “chunks” of story (rather than just mile-markers along the way), and they each added to the larger narrative, the length wouldn’t matter. I feel like SuperFogeys hits this mix very well. It seems like under these conditions, there would be more of a need to have fairly regular increments, or some other “system” of choosing what goes where. At any given time, the overall collection of strips is as “complete” as at any other time. It would seem weird to go through one group of 15 strips, and then another that was 60, only to arrive at essentially the same place before beginning on the next seemingly arbitrary group of 27. I would say short. If a new reader comes in and is lost they are not going to click back 50 strips to find out what is going on, they are going to leave and go somewhere else. Good point. New readers have been on my mind a lot lately. In our case, I’m not really focusing on long or short chapters so much as story arcs. I’m figuring the story arc should be short for the first one to intro the character, then extend as your readership goes up. That makes sense and is quite nearly what I did. The first chapter was 28 strips. Looking back, I think it could have been a lot shorter, but it’s not super lengthy like, say, the chapter that just wrapped up. I suppose it depends on whether the chapter is exciting or boring. I think shorter chapters work better for webcomics because you can’t read it in one sitting. You need the story to progress quickly, due to the update schedule being slower than flipping a page, or your readers will get bored. I think that’s what happened to me on the Jack Pot chapter. Or maybe it’s because I’m tired from work all the time. But, speaking of “The Captain and The Spy’ and “The Doctor and The Doctor,” I LOVED “The Doctor and The Doctor” chapter!!! I loved the entire thing from start to finish! I LOVE it when the characters have flashbacks. I’m glad it doesn’t happen all the time, but when it does it’s usually a GIANT treat! Concerning “The Captain and The Spy” – I admit I didn’t like it as much. But I liked it because it gave more depth to the Captain and Spy Gal’s relationship. I’m really glad to hear the love for Chapter 11. It’s one of my faves as well. The two flashbacks are essential to the story–especially the one that we’re about to get into!